This whole abomination of a law needs to go -- and the First Amendment restored to its original, unstained beauty. The court's original sin was to approve the McCain-Feingold Act in the first place in the guise of an election reform. This is supposed to be a free country. So what are we doing banning free speech when it's most needed -- just before supposedly free elections? Under this law, Chief Justice John Roberts asked in his mischievous way, may Wal-Mart still sell an action figure of a candidate within 30 days of election? Or will that section of the supercenter have to be closed off, like the beer and wine in Arkansas grocery stores on Sundays? If a film can be banned just before an election, why not books? Or Amazon's virtual library, Kindle? It's remarkable how quickly bad law becomes ridiculous law. McCain-Feingold has been an abomination since its inception, and now it's being applied to even more political speech. The thing just keeps on spreading, like an oil stain. John McCain has made a number of heroic contributions to American politics and life, but this law isn't one of them. How in the world did he ever wind up sponsoring this monstrosity? The only excuse I can come up with is that he got involved with bad company. Namely, the very epitome of liberal -- excuse me, progressive -- excess, Russ Feingold. Sen. Feingold's proposals regularly disappoint, but by now they no longer surprise. 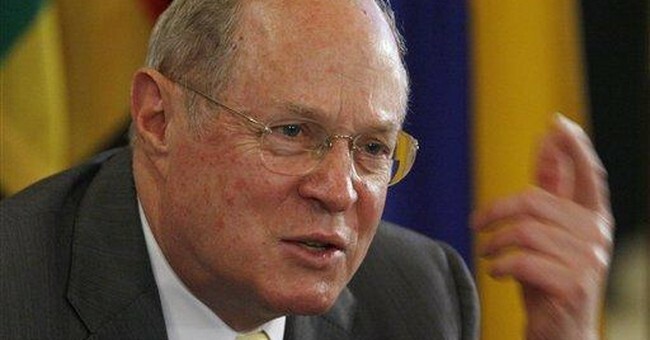 Justice Kennedy now has figured it out: The whole statute fails the constitutional test. It is an infringement on free speech -- an injury and insult to the First Amendment. But how long will it take the whole Supreme Court to figure that out? Let freedom ring. Also shout, stutter or even film if it wants to. Let a robust exchange of opinions proceed unhindered, trusting to the people, not the government, to judge their worth. Wild Freeborn, which is a perfect name for an American, is an 8-year-old girl in Asheville, N.C., who may have just learned a thing or two about free trade and its discontents. The young lady had the bright idea of using a YouTube video to sell enough Girl Scout cookies to send her troop to summer camp. Recession or no recession, it worked -- at least for a while. She got 700 orders, YouTube being what it is and American free enterprise being what it is. Or was. Because she was ordered to take down the video by scouting officials, who'd banned Internet sales. Is that a Scout law or just a conspiracy against free trade? Dear Miss Freeborn, free citizen and future tycooness: I'll take two boxes of the Trefoils (that's the shortbread), and a couple of the Do-Si-Dos (those peanut butter ones, um umm) and ... I'll keep finding any excuse I can to write about an American named Wild Freeborn.